Advantages: Excellent detail and casting; simple cleanup and assembly; worthwhile donor kits. Conclusion: High quality finishing touches for two excellent kits. 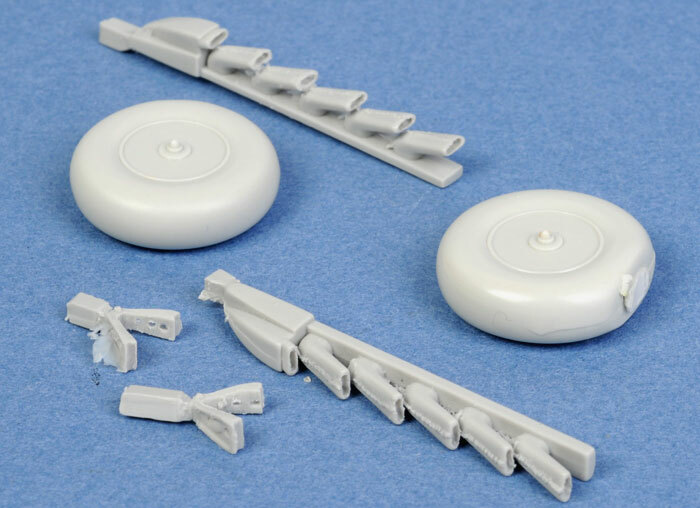 This is a perfectly cast set replacing the propeller blades and exhaust stacks in Hasegawa's 1/32 scale Junkers Ju 87 D and G Stuka kits. Detail is excellent. The exhausts feature hollow ends, and each stack features the raised Jumo casting mark. The new propeller blades have the locating pin cast in place, making alignment a very simple matter. Once again, this set for Hasegawa's 1/32 scale Tony kits is flawlessly cast and will require only minimal cleanup before installation. In this case, MasterCasters supplies replacement wheels with crisp hub detail and subtle flattening; plus exhausts with hollowed-out ends and weld beads (don't sand these raised lines off - they are supposed to be there! ), and new oleo scissors with open lightening holes for the main undercarriage legs. Both of these sets will add a luxurious finishing touch to these two excellent Hasegawa kits.